So I have to choose and use waterproof cosmetics. In case of waterproof products it takes time on removing. Some have to wash for three times or more. It is really hard to remove eye line between the eyelashes. When you come home late at night and wash your face sometimes you don't feel that it remove clearly. Also when use keep using cotton buds to remove the remains around the eyes it stimulates the area. So it leads for eye cream to not to function any more. Basically I liked to use Chanel or Loreal eye and lip remover. Both them really works great. 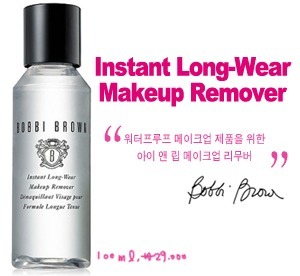 However using the Bobbi Brown gel eye linear it doesn’t work. Also for the waterproof mascaras. It does erase by other removers but you have to use it for several times. When I used this the first time I was surprised. Why didn’t I think before to buy this? I really love the color cosmetics on the Bobbi Brown but I didn’t really try to look at basic cosmetics. Any way, because of this it made my life easier in removing waterproof products. You have to shake it before using so the water and oil mixes well. For my case I erase the point makeup with this and wipe off my face using Uriage water cleanser. The oil substance makes it little bit slimy but works well in moisturizing. When you remove it with this and apply eye cream there is no sting even when it goes inside your eyes. The cover is like medicine cover, so you have to push it down and twist. It is uncomfortable but safe. Some people experience that it doesn't erase all even though you use great amount. When you wipe it off right away, it doesn’t erase all the makeup. You have to place the facial cotton with eye remover and wait for 10 sec. In this way the waterproof makeup will melt. Slowly wipe it off after. For the second time wipe off again by folding the facial cotton used in the first round. At last use cotton buds to remove it clearly.